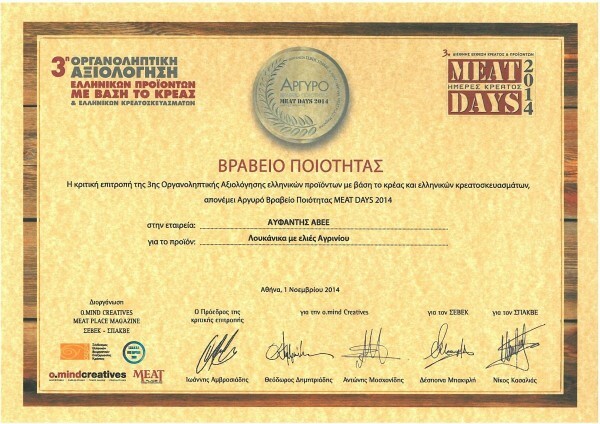 For a long time, Aifantis Group produces fine meats, meat products, cold cuts and sausages of superior quality. The reward came with the awarding of seventeen awards reflecting the overall sustained effort of Aifantis Group for creating, highlight traditional flavors, innovative top quality meat products and high nutritional value. 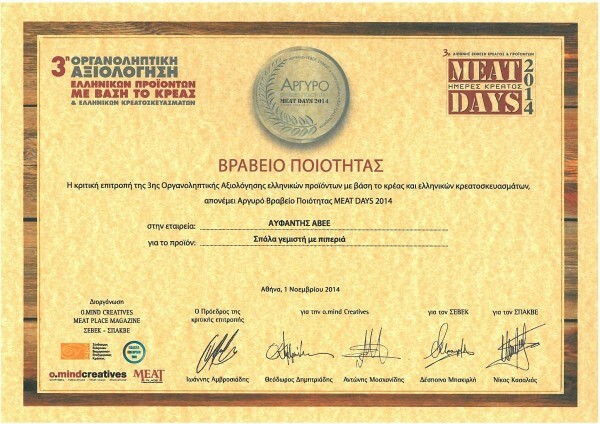 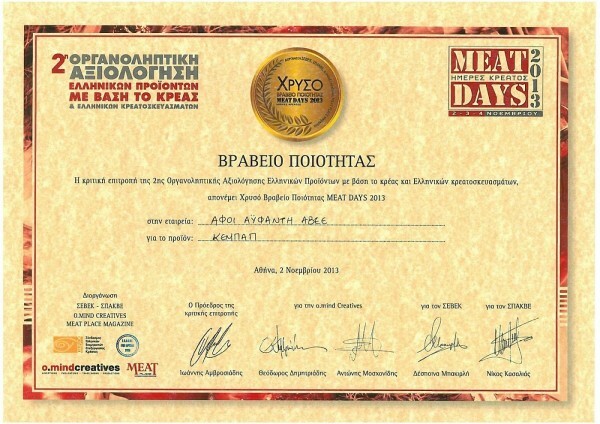 The awards were given during the 2nd and 3rd “Sensory Evaluation of Greek Meats and Greek Meat Products” that is organized every year at the exhibition “MEAT DAYS”. This is the only specialized exhibition organized in Greece having as its object the meat and its products. 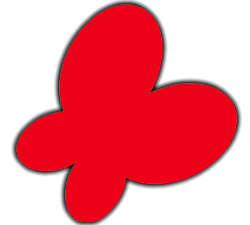 The biggest reward for us is the constant daily consumer preference. We use modern and innovative technologies to retain the unaltered aroma and authentic flavor of all our products. We have a fully integrated unit and can guarantee the excellent quality of raw meats at all stages, from rearing to finishing. In this way, by using the most modern and innovative technologies, we retain unaltered aroma and authentic flavor on all our products. 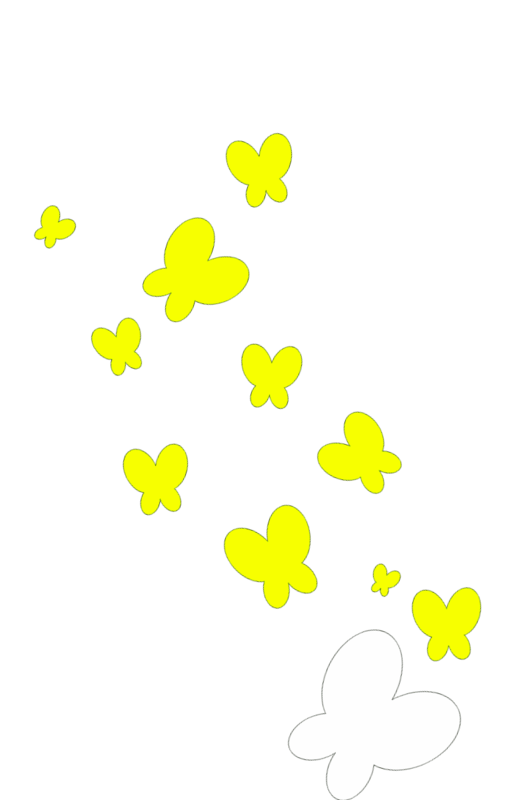 At Aifantis Group we have learned that confidence is gained only through sustained effort . The reward came with seventeen total prizes awarded to the Group during the 2nd and 3rd " Sensory Evaluation of Greek Meats and Greek Meat Derivatives." Specifically, the products awarded the Gold Quality Award, is the Kavourmas calf, kebab, pork souvlaki, sausages of the village, traditional sausages & handmade pork souvlaki. 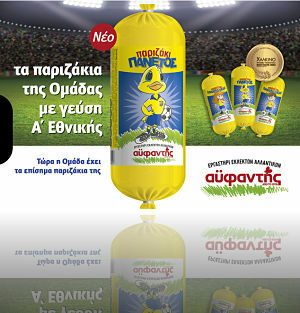 Silver in sausages made with Agrinion olives, traditional pork sausages and finally Bronze in Parizaki. We also received numerous awards for our known smoking products series. These products stand out from the competition for the fine cuts of meats, the outstanding quality, aroma and taste. Our "Smoked Silverside Calf" received the Gold award. The Smoked Pork, the Smoked Steak Calf and the Shoulder Stuffed with peppers received the Silver Award. The Smoked Pork Shoulder received the Bronze Award. The AIFANTIS meat products stood out among hundreds of other products recognized by consumers. The evaluation was done on many different levels, not only on taste, but on aroma, appearance, texture, color and many other characteristics. These distinctions are for the company yet another reward and recognition of the efforts of innovation, taste and products of top quality. Nevertheless, the greatest reward for AIFANTIS GROUP is the daily consumer preference .